This Drought's No Dry Run: Lessons Of The Dust Bowl This summer's dry weather is drawing comparisons to the droughts of the 1950s and even the Dust Bowl years of the 1930s. Technology and techniques developed from those hard times are helping to save some of today's crops, but there's no substitute for water. Scorched pastures are spreading across central Illinois and the rest of the Midwest. Technology and techniques developed from previous droughts like the Dust Bowl are helping to save some of today's crops, but there's no substitute for water. 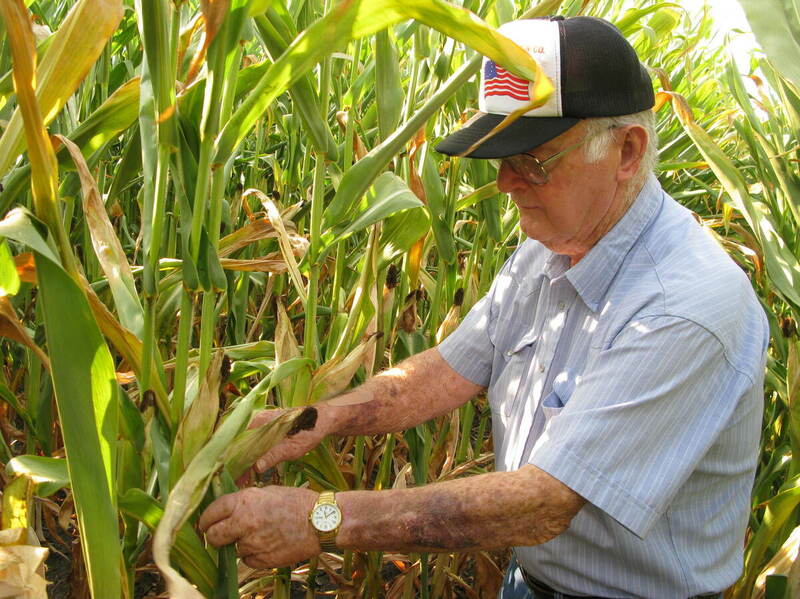 Charles Hildenbrand surveys the family's corn crop outside Thawville, Ill. He doesn't remember much from the Dust Bowl days, but says technology has saved what little corn the farm does have this year. Walking deeper into the 7-foot-high corn stalks, the temperature — already in the 90s — becomes stifling. Here, the ears are smaller. Peeling back the husks on an undersized ear of corn, Hildenbrand exposes kernels that are drying up. "It just never really matured," he says. "And [if] we got out in there farther, it's gonna be just that much less." More than 63 percent of the country in the lower 48 states is experiencing drought, leading some to compare the summer of 2012 to the droughts of the 1950s and even the Dust Bowl years of the 1930s. John's father, Charles Hildenbrand, was born and raised on this land and farmed these fields for decades — as did his father before him. The 84-year-old was too young to remember much about the Dust Bowl droughts of the 1930s — other than he and his father dragged their mattresses outdoors to sleep at night. But he says even though this year's drought is the worst he's ever seen, today's hybrid corn is surviving better than the corn he and his father planted ever could. "If this would've been open-pollinated, it would have been all brown, probably. And there probably wouldn't be any kernels on these ears," he says. "The cobs is about all that would be there, I'm afraid." The development of hybrid crops that are better able to withstand heat and drought is one of the only reasons the Hildenbrands have a chance of a small crop this year. And it's one of the most important developments in farming since those devastating droughts of yore. 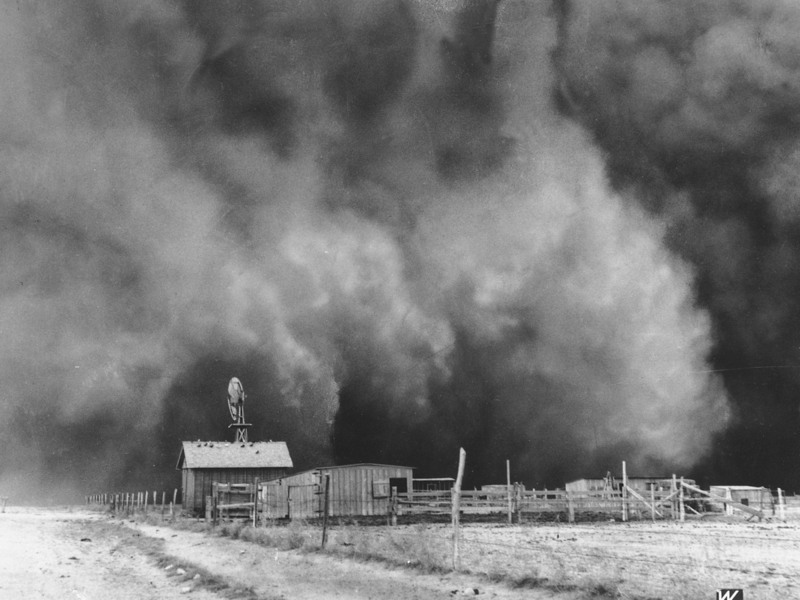 A gigantic dust cloud engulfs a ranch in Boise City, Okla., in 1935. In the '30s and '40s, Charles Hildenbrand used horses, replaced today by tractors, combines and planters with high-tech gadgets and computers. So is it even fair to compare this summer's drought to the devastating droughts in the 1950s, or even the Dust Bowl years? "Certainly from a geographical footprint, it's right up there with the '50s and '30s at over 60 percent," says climatologist Mark Svoboda of the National Drought Mitigation Center at the University of Nebraska-Lincoln. "But the '30s and '50s were multiyear droughts," he says, "and this drought, so far for the majority of the country, is not a multiyear drought yet." In those exceptionally dry years of the 1930s, farmers and ranchers plowed up the Great Plains to plant wheat. They ended up losing not just their crops but their top soil, too, as winds blew it into giant dust clouds that darkened the skies for hundreds of miles. That spurred the creation of the Soil Conservation Service, which paid farmers to not farm some land and to replant the native prairie grasses to keep soil in place. Svoboda says the USDA agency also encouraged farmers to change their tillage practices. "Instead of tilling the soil over, they use what they call no-till drilling or low-till ... which doesn't disturb the soil. 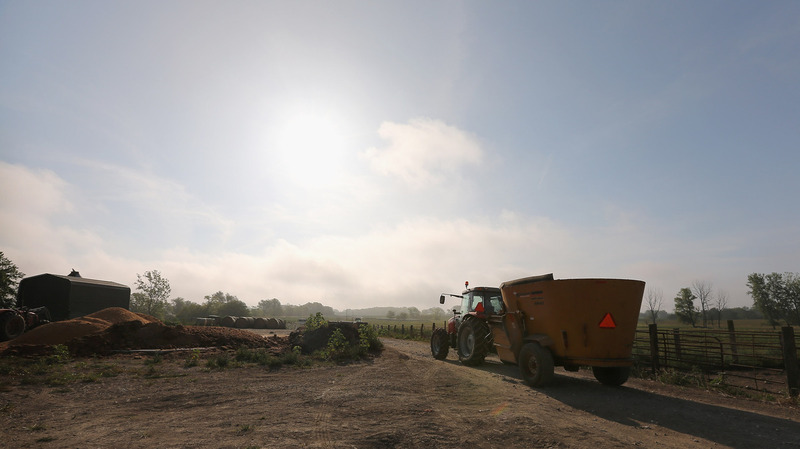 It plants directly into a residue-covered soil that retains a lot of soil moisture in that upper part of the profile," he says. In addition to being better able to preserve what little moisture is in the soil, hybrid crops send roots deeper to find moisture. Still, University Of Illinois agronomist Emerson Nafziger says there is one constant and critical truth to farming. "The hybrids and so on are improved now, but we certainly don't have hybrids that can do without water," he says. Looking over his withering crops, John Hildenbrand couldn't agree more. "I was reading the CropWatchers in the Farm Bureau paper. He said, 'We're no longer crop watchers — we're deterioration watchers.' And that's really what we're doing; we're watching our crops deteriorate in front our eyes," he says. Hildenbrand estimates his yields already will be less than half of normal, and if there isn't some rain and cooler temperatures soon, he may lose it all. Then he'll rely on maybe the most significant development since the 1930s in helping farmers deal with losses: crop insurance.